Mouse anti Guinea Pig CD8 antibody, clone CT6 used for the detection of CD8 expressing cells in the guinea pig lungs by immunohistochemistry on formailin fixed cryosections. Evaluation of cellular immune response inside the granuloma of infected lungs. Scattergrams show the numbers of CD4+ T cells, CD8+ T cells, granulocytes and MHC II+ cells per unit area of granuloma from different experimental groups after 30 days of therapy. The number of different immune cells inside the granuloma in the lung sections from different experimental groups were counted microscopically and expressed as number of cells per unit area of granuloma. Minimum of 1000 cells were counted from randomly selected, at least 10 fields. Sections were taken from lung samples of 4 animals per group. The representative photomicrographs show the positively stained cells with red arrow in control group, drug or drug + MIP group in each panel. DAB was used as substrate in staining granulocytes while VIP red was substrate for staining other types of cells. * p<0.05, ** p<0.01. From: Gupta A, Ahmad FJ, Ahmad F, Gupta UD, Natarajan M, et al. (2012) Efficacy of Mycobacterium indicus pranii Immunotherapy as an Adjunct to Chemotherapy for Tuberculosis and Underlying Immune Responses in the Lung. Monitoring of activated T cells in the infected lungs during therapy. Percentage of activated CD4+ T cells (A) and CD8+ T cells (B) in drug or drug plus MIP group were evaluated at different time points during the course of therapy. The percentage of respective cells in infected control group has been shown in the inset of bar diagram. 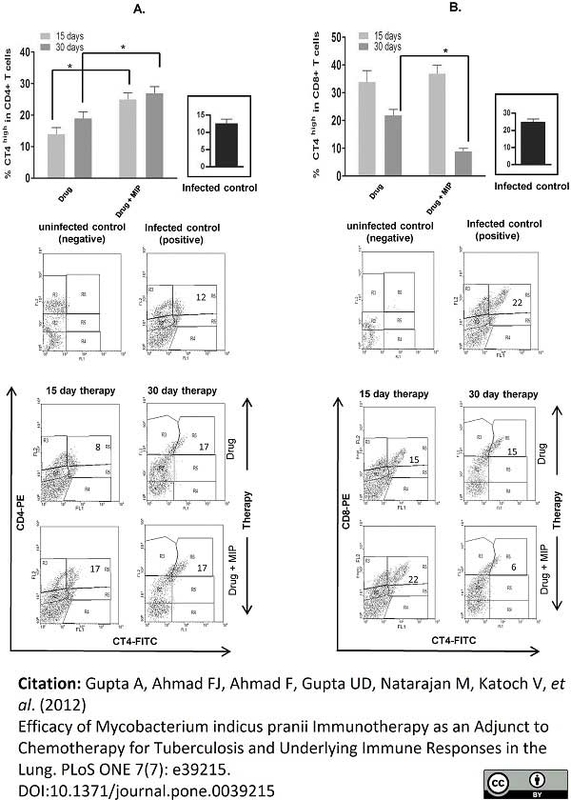 Activated T cells were analyzed based on the expression of homing receptors as shown in the representative contour plots and compared at 15 days and 30 days of therapy. In each plot, region R6 represents T cells with high homing receptor expression and the corresponding percentage value is mentioned inside the region. Data represents the mean value of four animals in each group. * p<0.05. Uninfected animal (naive) was taken as uninfected negative control and untreated animal at 30 days post infection was taken as infected positive control. Mouse anti Guinea Pig CD8 antibody, clone CT6 reacts with guinea pig CD8 present on cytotoxic T-cells. CD8 comprises 2 subunits, alpha and beta and exists as either an alpha/alpha homodimer or an alpha/beta heterodimer. Sequence analysis suggests that guinea pig CD8 is more closely related to human than rat or mouse CD8 (Nagarajan et al. 2004). Spleen cells from immunised BALB/c mice were fused with cells of the X63.Ag8.653 mouse myeloma cell line. This product should be stored undiluted. Avoid repeated freezing and thawing as this may denature the antibody. This product is photosensitive and should be protected from light. Should this product contain a precipitate we recommend microcentrifugation before use. Use 10ul of the suggested working dilution to label 106 lymphocytes in 100ul. Tan, B.T.G. et al. (1985) Production of monoclonal antibodies defining guinea pig T-cell surface markers and a strain 13 Ia-like antigen: the value of immunohistological screening. Steerenberg, P.A. et al. (1991) Tumour rejection after transfer of line 10 immunity is mediated by two T-cell populations. Cancer Immunol. Immunother. 34: 103-110. Steerenberg, P.A. et al. (1990) Tumour infiltrating leucocytes (tils) during progressive tumour growth and BCG - mediated tumour regression. Virchows Archiv Cell Pathol. 59: 185-194. Baker, D. et al. (1987) Changes in lymphocyte subsets after treatment with cyclophosphamide and during the development of contact sensitivity in the guinea pig. Int J Immunopharmacol. 9 (2): 175-83. Antoniou, A.V. et al. (1986) Immunocytochemical identification and quantitation of mononuclear cells in the meninges during the development of chronic relapsing experimental allergic encephalomyelitis (CREAE) in the guinea pig. Cell Immunol. 97 (2): 386-96. Liversidge, J. et al. (1987) EAU in the guinea pig: inhibition of cell-mediated immunity and Ia antigen expression by cyclosporin A.
Clin Exp Immunol. 69 (3): 591-600. Liversidge, J. & Forrester, J.V. (1988) Experimental autoimmune uveitis (EAU): immunophenotypic analysis of inflammatory cells in chorio retinal lesions. Curr Eye Res. 7 (12): 1231-41. Debout, C. et al. (1991) The Kurloff cell in estrogenized guinea pigs as a CT7+ 8BE6- CT6- MR-1- CT10- IgM- lymphocyte with natural killer activity. Nat Immun Cell Growth Regul. 10 (6): 327-35. Shang S et al. (2011) Activities of TMC207, rifampin, and pyrazinamide against Mycobacterium tuberculosis infection in guinea pigs. Antimicrob Agents Chemother. 55 (1): 124-31. Lacy HM et al. (2011) Essential role for neutrophils in pathogenesis and adaptive immunity in Chlamydia caviae ocular infections. Komori, T. et al. (2011) A Microbial Glycolipid Functions as a New Class of Target Antigen for Delayed-type Hypersensitivity. J Biol Chem. 286: 16800-6. Hiromatsu, K. et al. (2002) Induction of CD1-restricted immune responses in guinea pigs by immunization with mycobacterial lipid antigens. Kramp, J.C. et al. (2011) The in vivo immunomodulatory effect of recombinant tumour necrosis factor-alpha in guinea pigs vaccinated with Mycobacterium bovis bacille Calmette-Guérin. Clin Exp Immunol. 165: 110-20. Mishra, N.C. et al. (2010) Sulfur mustard induces immune sensitization in hairless guinea pigs. Schleiss, M.R. et al. (2007) Preconceptual administration of an alphavirus replicon UL83 (pp65 homolog) vaccine induces humoral and cellular immunity and improves pregnancy outcome in the guinea pig model of congenital cytomegalovirus infection. J Infect Dis. 195: 789-98. Turner, O.C. et al. (2003) Immunopathogenesis of pulmonary granulomas in the guinea pig after infection with Mycobacterium tuberculosis. Yang, H. et al. (2011) Three protein cocktails mediate delayed-type hypersensitivity responses indistinguishable from that elicited by purified protein derivative in the guinea pig model of Mycobacterium tuberculosis infection. Baldwin SL et al. (2012) The importance of adjuvant formulation in the development of a tuberculosis vaccine. J Immunol. 188 (5): 2189-97. Xia, J. et al. (2014) Virus-specific immune memory at peripheral sites of herpes simplex virus type 2 (HSV-2) infection in guinea pigs. PLoS One. 9 (12): e114652. Jeevan A et al. (2013) Guinea pig skin, a model for epidermal cellular and molecular changes induced by UVR in vivo and in vitro: effects on Mycobacterium bovis Bacillus Calmette-Guérin vaccination. Photochem Photobiol. 89 (1): 189-98. Gupta A et al. (2012) Protective efficacy of Mycobacterium indicus pranii against tuberculosis and underlying local lung immune responses in guinea pig model. Gupta, A. et al. 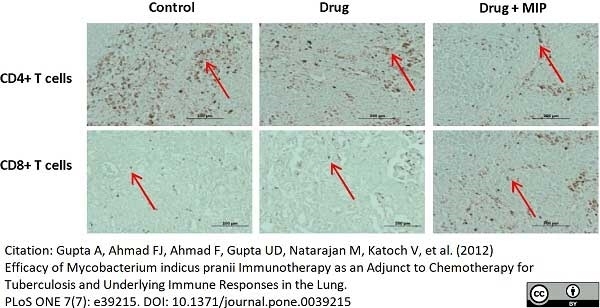 (2012) Efficacy of Mycobacterium indicus pranii immunotherapy as an adjunct to chemotherapy for tuberculosis and underlying immune responses in the lung. PLoS One. 7 (7): e39215.